David Dilwyn John (1901-1995) was educated at Bridgend School and University College of Wales, Aberystwyth, graduating BSc. in 1924 and MSc. in 1925. He then worked on the "Discovery Investigations" in the Antarctic polar regions. He participated in three cruises between 1925 and 1935. The first, on Discovery, between 1925 and 1927, worked in the seas around South Georgia and the Antarctic Peninsula. He then spent two years on RRS William Scoresby on a whale marking expedition around South Georgia. In 1931-33, he was Chief Scientist on Discovery II on the first winter circumnavigation of Antarctica. He then joined the the Natural History Museum in London as Assistant Keeper in charge of the Echinodermata Section in 1935 working on echinoderms collected by the Discovery, on the B.A.N.Z.A.R.E. expedition between 1929 and 1931, and on the Rosaura and Scotia cruises. He published a key expedition report on "The Second Antarctic Commission of the R.R.S. Discovery II." in the Geographical journal in 1934 and lectured on this to the Society (see below). Some further details on this and a picture of him in later life, are given in a Museum blog article on The Welsh in Antarctica. In that article there is also a picture of him on the John Peaks in the South Orkney Islands. The peaks were charted in 1933 and named after him. He was away from the Natural History Museum on military service from August 1939 until July 1945 a regimental officer in Anti-Aircraft Command. He was promoted Major in 1942. The Society, while welcoming Dr D. Dilwyn John as the new Director of the National Museum of Wales (and thus as an Ex-Officio Member of its Council) would record its gratitude to Sir Cyril Fox, for his work on behalf of the Museum and the Society and of Welsh Culture during his period of office. He was the first member of staff of a major national museum to become Director, and also the first Welshman to fill the post. The tenure of his directorship and his appreciation of the part that the society played in it's development was clearly given in the introduction he wrote in this booklet regarding the Museums golden jubilee celebrations in 1957. There shall be and is hereby constituted and founded a museum in the city of Cardiff with the name of "The National Museum Of Wales". With those words, the first of the Charter of Incorporation granted by King Edward VII on 19th March 1907, the National Museum had come into existence on paper. It was five years before the foundation stone of a building was laid, fifteen before the first part of it was opened to the public. But meanwhile a staff was appointed, departments were set up and, while building went on, collections were exhibited and temporary exhibitions were arranged. Now, fifty years later, there is a handsome if half-complete building in Cardiff, a rapidly developing Folk Museum nearby at St. Fagans, small outlying branch museums at Penarth and Caerleon in the south, and (in a Ministry of Works building) at Segontium near Caernarvon in the north, a scheme whereby smaller independent museums in Wales and Monmouthshire are affiliated to the National Museum, and a Museum Schools Service by means of which specimens from the museum are distributed to all parts of Wales. 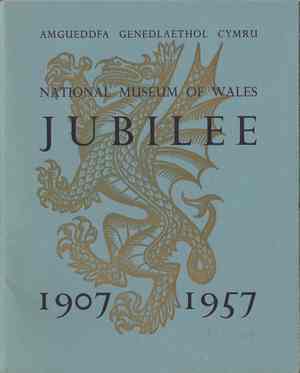 This commemorative booklet gives some account of how that development took place and describes the hopes with which the museum enters its fifty-first year. Few names have appeared in this brief account, but the number to whom the National Museum of Wales has reason to be grateful is very large. It is grateful to those who envisaged the institution, and to those who helped to realise it in a Charter of Incorporation, among them the Cardiff Naturalists' Society, One of whose objects continues to be the furtherance of the work of the National Museum; grateful to the large number who subscribed to the Cardiff and later funds, of whom many have given again so that the Folk Museum may develop, and to the Welsh County Councils without whose generous help it could not have done so; to the generosity of many of Welsh descent now abroad, particularly in America, and to the support of the "Friends." Note... Sadly the Society no longer has direct representation on the court of governors as one of D. Dilwyn John's successors determined that it was inefficient to have external groups taking part on Museum Council. This author considers that the museum has lost immensely from losing its link to its own past as there have been a number of it's own publications since that either note the part that a single person played (and not always that), and forget that they came together as a working group in a Society, to make things happen. The Council heard with pleasure of the honour bestowed on Dr. D. Dilwyn John, who had been made a C.B.E.